The Philip Brooks House Association honored Co-Director of Industrial Areas Foundation Ernesto Cortes, Jr., on Friday for his work as a community organizer through IAF, which provides leadership development for the politically disenfranchised. “It’s an honor for me to win this award, but most importantly it’s an honor for who I work with,” Cortes said, after receiving PBHA’s Robert Coles “Call of Service” Award. Dean of the College Evelynn M. Hammonds, who spoke at the event, said that the award is an annual “reminder of the core values of the college,” adding that a college education should teach not only individual skills but also the value of public service. The award was established six years ago to honor former PBHA volunteer and Harvard Medical School professor Robert Coles ’50, who was present at the event. “Expanding the base for organization to get new perspectives and new ideas is the only way to stop oligarchy,” he said, adding that “new people coming in” is what makes community organization successful. Speaking about politics and the upcoming elections, Cortes critiqued the status quo, saying that the state has transformed people “from citizens to a managed electorate,” provoking a round of applause. “Politics is about a different kind of local engagement,” he said. “Cortes is restoring American Democracy,” said Gene A. Corbin, assistant dean of student life for public service and a former community organizer for IAF in Texas. When another audience member asked whether there have been situations in which compromise was not possible, Cortes’ answer was curt. “No,” he said. Members of the crowd in Memorial Church said they were dazzled. “Get over yourself, Harvard: This man is better than us,” said Corbin. 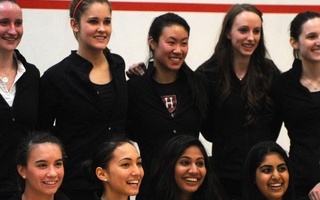 On Sunday, both Crimson squash teams will head to Yale’s Brady Squash Center for their final match-ups until CSA Team Championships.